From finding a suitable study program to enrolling at a German university. If you’re wondering about what you need to do to study in Germany, and you’re confused by the amount of information available on what steps you need to take, you’re at the right place. We have simplified the process of studying in Germany as an international student into 8 steps you need to go through. Follow these 8 steps one by one to keep track of where you are right now and what you need to do to make your dream of studying in Germany a reality. Get Your German Student Visa. Finding a university and choosing a study program that suits your interests is the first step to planning your studies in Germany. This is not supposed to be a major problem because there are many universities and countless study programs available – and their quality is undoubtedly world-class. Regardless of what direction you want to go in life, there will certainly be a study program that will match your studying aspirations and future plans. 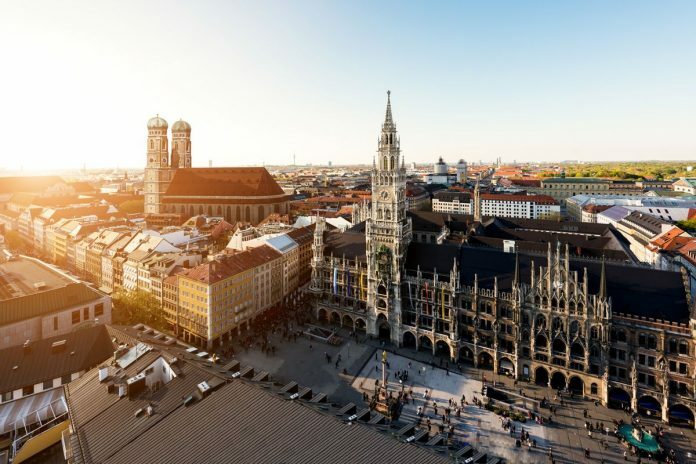 But, finding a university and a study program may take time if you haven’t given much thought to this matter before starting your application process to study in Germany. The high number of available courses could be one of the reasons you haven’t made a decision yet. We suggest you think about the study program at least 3 months before making a final decision. This period of time is enough to allow you to scan all German universities that offer courses related to your professional field. Once you find those German universities, you can focus on a smaller list of universities that seem ideal for you. You can either decide to focus on just one university or apply to several that you like best to increase your chances of securing admission. Finding a university and study program is very important because it determines everything. Here is the list of universities in Germany and here is the list of study programs available as of 2018. Now that you have decided what university and what study program you want to attend you must check out all the requirements. For this purpose, you check the university website and their admission requirements section. If there are things you don’t understand never hesitate to contact the university directly. Entry requirements are different depending on the university and the type of course you choose, so it’s recommended to read the requirements section multiple times. Bad timing and missing documents are the most common issues that happen at this stage and both can lead to delayed admission or even rejected applications. To avoid such possibility you must prepare these documents early enough. For example, sitting for a German language proficiency standardized test you need to take a language course for at least three months. If you start learning German from scratch it takes way longer than this. Further legalizations of your documents may have a similar processing time until they’re issued to you. Taken any occasional delay originating from the nature of the process, you must start preparing your documents at least 4 months before applying for your place at the university. Your success at university highly depends on your skills in the German language, even if your program is in the English language. Having a solid-rock knowledge in the German language guarantees you will comprehend study materials, understand what is taught in lectures while being able to express your thoughts properly. In Germany, most undergraduate courses are taught in the native language, whereas many study programs at higher academic levels are taught entirely or partially in the German language. Other than at university, you will often have to speak German with locals. Learning German from scratch can be difficult, but if you start early, by the time you come to Germany you’ll be speaking German perfectly. We recommend starting at least 6 months ahead of the commencing of your course (or before the application if German language proficiency is a requirement) to gain a basic comprehension of the German language. You can also check out our list of the top language schools in Germany. The next step is making sure you have the required financial means to live and study in Germany. Under the current law, every foreign non-EU or non-EEA student must have proper financial means to finance their stay in Germany during their studies. An international student in Germany must possess a minimum of €8,640 which is estimated to be enough for a student to cover the cost of living for the first year of his studies. This amount of money needs to be deposited into a German blocked bank account. Naturally, for a student, this a large amount of money and takes time to collect. It’s highly recommended you start saving money a long time before you initiate your university application, except when you’ve been granted a scholarship and use it as proof of your financial means. Normally, 6 months before your application would be early enough to start collecting this money and two weeks before applying for your student visa you must have them deposited. Here are some ways you can finance your studies in Germany. After double-checking your application documents, it’s time for you to submit the application. The application can be carried online, but there may be universities that receive only applications in person or by post. Contact your university to see you which way you can submit your application. Most German universities are part of the national university online application platform known as UniAssist. In addition to this, there are universities that run their own online admission platform on their website. Keep in mind that universities in German are a hub for international students and admission committees are heavily loaded with foreign applications. Going through all the applications takes time and you need to submit your application as soon as possible to take advantage. You must submit your application once the call for application is opened and then wait for the admission letter. Depending on what level of studies you’re pursuing in Germany, the application procedures vary slightly. If you’re a student coming from a non-EU and non-EEA country you must get a German student visa. For detailed guidance on how to get your student visa, please read our article “German Student Visa Requirements“. By the time you are collecting the documents we suggest to contact the German embassy/consulate in person and make a visa appointment. Make sure you have secured proper financial means for studying in Germany. One of the easiest and the best way to convince the authorities that you have enough money to cover your study and living cost is by opening a so called Blocked bank account. 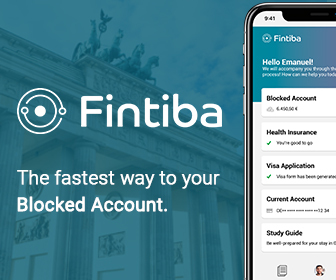 We suggest to open a blocked bank account with Fintiba. 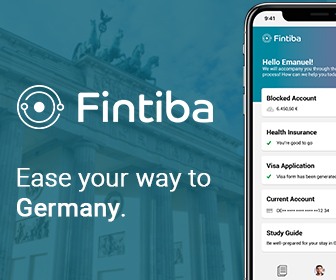 Fintiba is a German company and is officially approved by the German Federal Foreign Office. Along with other documents, the German embassy/consulate in your home country will also require you to get a health insurance policy before granting you a student visa. 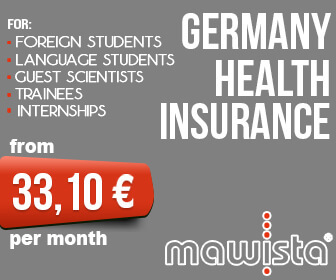 Most international students in Germany prefer to get health insured with MAWISTA. MAWISTA a leading German company in the health insurance industry. Still have questions about getting the proper health insurance? Learn more about health insurance in Germany from experts. Now that you’re officially an admitted student in Germany and you have your student visa you must think of a place to stay in. Accommodation in Germany for international students is not that expensive, but is normal that as a foreign student, you should strive to find the most financially suitable place for you. We recommend you give the deserved priority to this issue because it may cost you a lot of time which otherwise you would use to study. With that in mind, you can try to find an accommodation online before landing in Germany. In the end, if you don’t find something that fits for you, at least you have a list of resources to contact to secure your accommodation the day you land in Germany. As with other steps explained above, you must find accommodation as soon as you gain your student visa. Two weeks before your landing in Germany should be fine. The final step to officially be given a place at the university of your choice is to enroll in the course at which you have been admitted. In this sense, the enrollment process takes you from a successful applicant to a registered student in Germany. The public higher education in Germany is offered for free, but you will still have to pay a registration fee which ranges somewhat between €150 and €250. Additionally, you will have to pay for your Semester ticket to use public transportation free of charge for 6 months. Following your enrollment in the university administration will issue you a registration document (ID card) which can later be used for residence permit application and attendance of your classes. An important note: You need to re-register each semester following the completion of the previous one and again you will have to cover the same registration costs. Make sure to also read our article about the first things you need to do after you arrive in Germany.